This is such a simple little investigation you can do with materials you already have in your home, and it has WOW factor! My boys loved watching the colours swirl and combine! Pour milk into the dish, so that it completely covers the bottom (1cm depth or so), and allow milk to settle. Add one drop of each of the four colours in separate quarters of the plate, close to the centre but not touching. Grab your cotton tip and have your kids predict what will happen when they touch the tip to the surface of the milk in the centre of the plate. Record ideas if you like. Get your child to touch the tip to the milk and see what happens (no reaction). Dip the cotton tip into the dishwashing liquid and again, ask the children to predict what will happen this time. 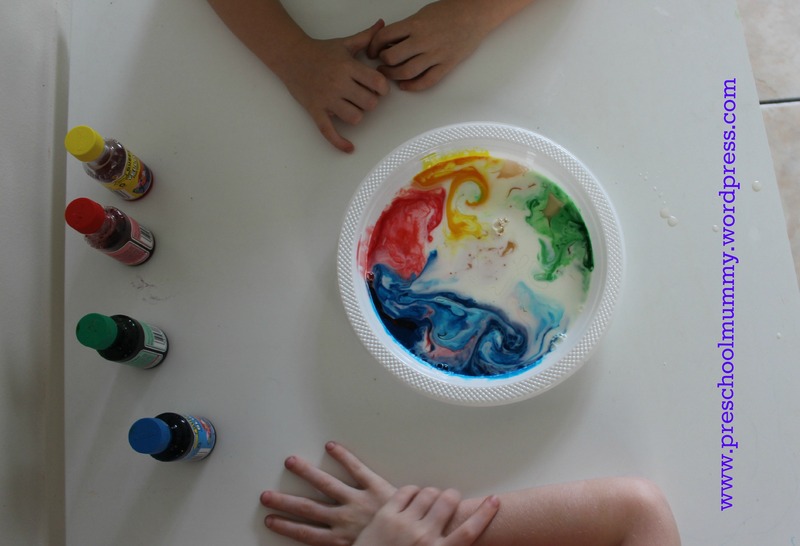 Investigate what happens when your child touches the cotton tip to different parts of the liquid, and notice how when the cotton tip is removed, the colours still swirl! The molecules of fat suspended in the liquid (milk) are sensitive to the chemical molecules in the dishwashing liquid. As the parts of the dishwashing liquid try to attach to the fat molecules in the milk, it forces them to roll and twist around. The food colouring is forced to contort in between the “dancing” molecules, giving the appearance of swirling movement. Try adding more soap to the dish, and watch as more swirling occurs, as a result of any remaining single molecules attempting to match up. Next Post I think too much about poo, do you? Thanks for reminding me of this! I did it with my girls years ago, but had forgotten. Gotta do it with my boy soon.